Would you turn down three billion dollars from Mark Zuckerberg? When he was just twenty-three years old, Evan Spiegel, the brash CEO of the social network Snapchat, stunned the world when he and his co-founders walked away from a three-billion-dollar offer from Facebook: how could an app teenagers use to text dirty photos dream of a higher valuation? Was this hubris, or genius? In How to Turn Down a Billion Dollars, Billy Gallagher takes us inside the rise of one of Silicon Valley’s hottest start-ups. Snapchat began as a late-night dorm room revelation before Spiegel went on to make a name for himself as a visionary CEO worth billions, linked to celebrities like Taylor Swift and his fiancée, Miranda Kerr. A fellow Stanford undergrad and fraternity brother of the company’s founding trio, Billy Gallagher has covered Snapchat from the start. 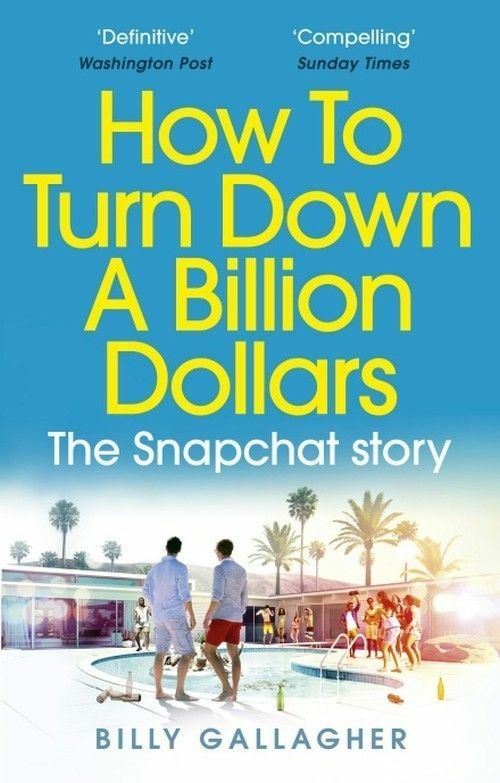 His inside account offers an entertaining trip through the excess and drama of the hazy early days with a professional insight into the challenges Snapchat faces as it transitions from a playful app to one of the tech industry’s preeminent public companies. In the tradition of great business narratives, How to Turn Down a Billion Dollars offers the definitive account of a company whose goal is no less than to remake the future of entertainment.